Yacht lift is specifically engineered to handle a variety of vessels, including large and super yachts, fishing boats, sailboats, powerboats and heavy tugs with capacity in a range of 10 ton to over 1000 ton. 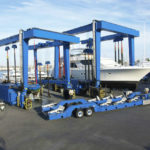 Our yacht lifts provide durable and dependable operations at your marinas, shipyards and docks, and are meant for decades of trouble-free productivity. 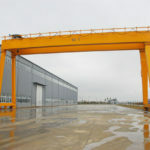 Each of our yacht lifting crane will be designed and built to meet your business needs. We also offer a number of design options and accessories to make sure you end up with the best boat handling solution with your goals in hand. We produce multiple types of yacht lifters to meet your business demand and ensure maximum security and efficiency in boat handling operations as well. The yacht travel lift can be classified into remote controlled boat lift and cabin control travel lift according to the control mode, small boat hoist and large boat lift according to the boat size, 50 ton boat travel lift, 100 ton travel lift, 200 ton travel lift, 500 ton boat hoist and 1000 ton boat lift according to rated load capacity. 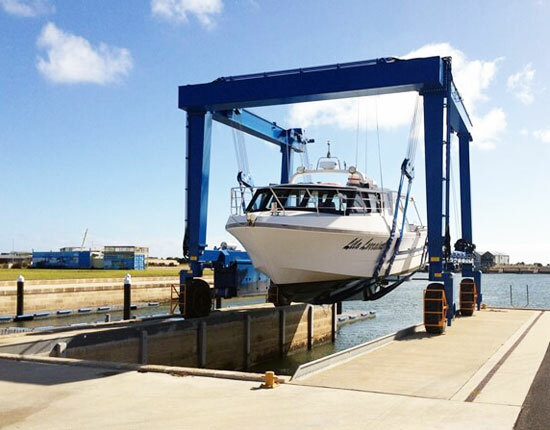 When buying a yacht travel lift crane, you should consider a few things so as to make the best choice, such as the boat lift crane capacity, span, overall height and width, lifting speed, steering mode, control mode and environmental conditions. 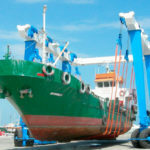 If you are unsure as to which form of boat crane is right for your business, please feel free to contact us and discuss your travel lift specification with our experts. 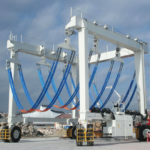 This vessel handling equipment is engineered to perform lift-in, lift-out and transportation of small to large boats in shipyards, marinas, yacht clubs and water recreation center. 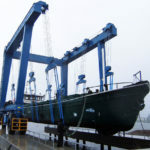 To be specific, it can haul a boat out of the water for repairing, maintaining or just arranging several ships in rows so as to improve the utilization of limited yard space. It can also used to launch a newly built ship into water. The boat lift makes the transportation of a large ship effortless, efficient and safe in your yard. The marine yacht lift provides flexible operations since it is mounted on tires, enabling you to position it anywhere you desire. It delivers several types of travelling and steering modes, including straight travelling, oblique travelling, fixing axle steering, 90 degree steering and Ackermann steering. The independent 4-wheel steering system allows you to align the wheels under any conditions. It is also built with perfect maneuverability, which can be fully functional even in a limited space. 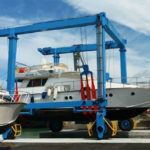 How Does A Yacht Lifting Crane Work? 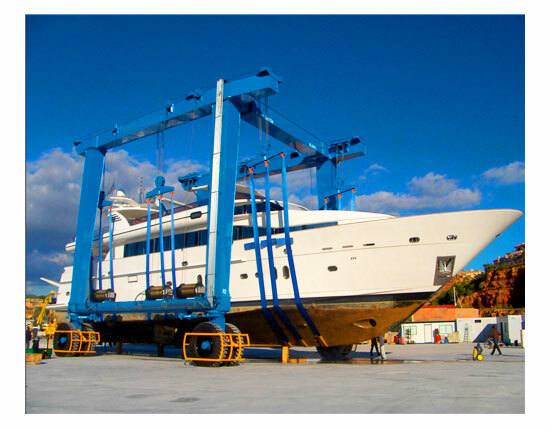 The yacht lift systems incorporate the uses of several simple units and mechanisms to perform the lifting and transporting work, including hoisting mechanism, steering system, travelling system, hydraulic transmission system and electric control system. The hoisting mechanism is mainly composed of winches, fixed pulleys and movable pulleys. Each winch consists of a reel with a wire rope groove. The lifting points can be adjusted to keep a synchronous raising. The steering system is available in a variety of modes to serve different work demands. Our marine hoist crane has two pairs of standard steering wheel sets which can achieve 90 degree steering and then lateral walking. The travelling mechanism comprises 8 tires, motors and reducers. It provides maximum safety for the crane movement. The power unit includes the main engine, a transmission pump powering for lifting and steering system, a fuel tank, a distribution valve, a solenoid valve and a battery pack. 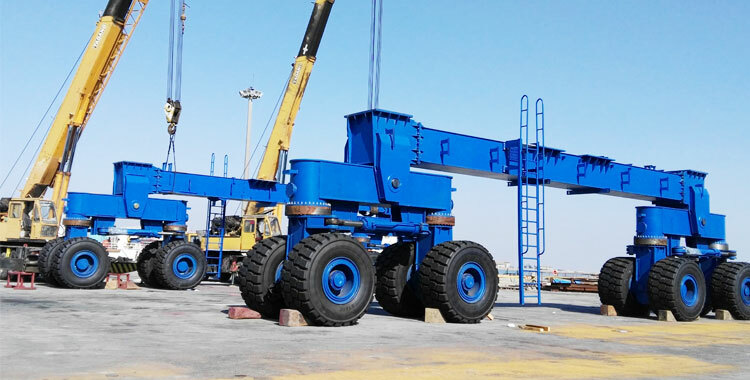 Both lifting and travelling mechanisms utilize hydraulic transmission system as it delivers smooth movement, fast response, low inertia and easy operation. 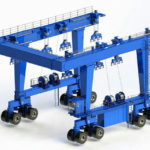 This mobile boat crane is typically operated by means of remote control or cabin control. The remote controlled travel lift is more often found in light duty applications. It has lower cost than a cabin controlled boat hoist. Whereas cabin control is more suitable for large tonnage boat handling applications. Due to the confines of the cab, this control mode requires a professional operator and an coordinator to implement the operation work. Check travel lift slings to make sure they are not frayed. Check rubber tires to ensure they are in good working conditions. Check steering wheels to make sure they are synchronized. Check strap pins, wire cables and other critical parts. A travel lift operator should be properly trained so as to be fully competent to undertake the job. He or she must be strictly follow the operation manuals to avoid accidents as much as possible. With our excellent engineers, we are capable of offering custom design as required. Each of our yacht lifts will be designed and built according to customer’s requirements. 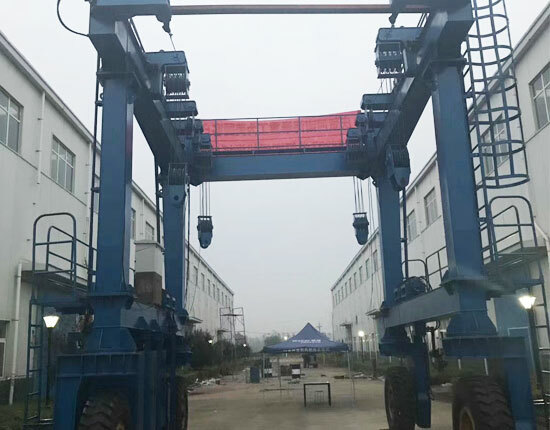 We can be recognized as a reputable travel lift manufacturer and supplier in China with decades of experience in crane design, manufacturing and service. The boat lift produced by our factory is made of high quality materials which can last for decades. The travel lift installation, commissioning and maintenance services are available as needed. To get an affordable yacht lift, contact our sales representative online today!